Jack Barros is a full time Worcester Wedding DJ that has entertained thousands of guests at functions over the past thirty years. Congratulations and thank you to Theresa Gaffney and James V Hollie on their recent wedding on Cape Cod at the Lighthouse Inn. ! Thank you for inviting me to be such an important part of your unique wedding day! 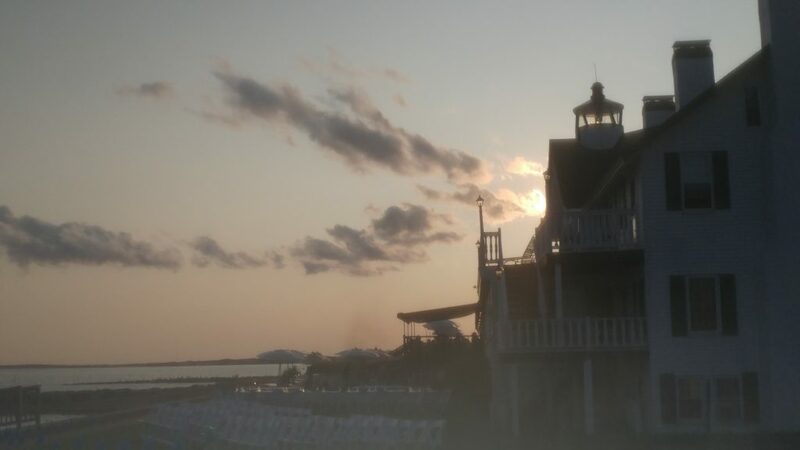 The Lighthouse Inn provided the perfect setting for this enchanting sunset ceremony. Located on the southern facing shore of Cape Cod, in charming West Dennis, MA, the stage was set for the two to become one. 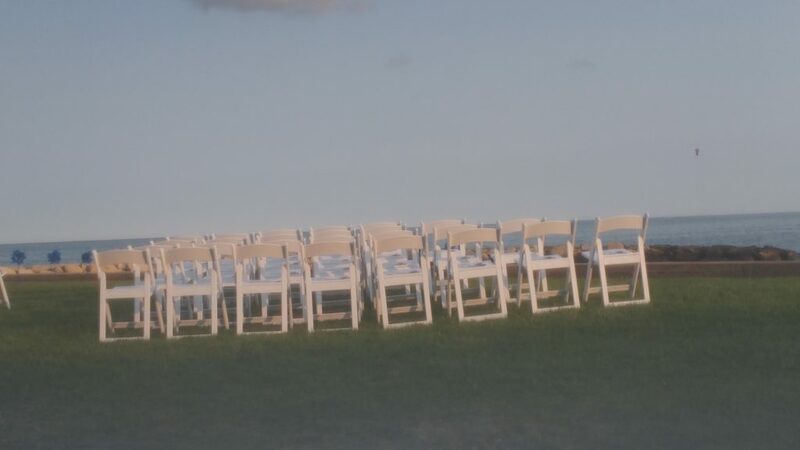 Thoughtful planning by the bride & groom assured that everyone was comfortable for the seaside nuptials. The invited guests were treated to dinner before the ceremony! A first for me and for the venue. Bill Sherman and his staff did a fantastic job providing for this first of its kind (for any of us) dinner first, then the ceremony and capping it off with an eventful reception. The North Atlantic Ocean was the backdrop for this lovely ceremony officiated by Cedric Saunders with readings by Liz Londergan, Deb Wallace Mehigan, Stuart Coleman and Justine Lomanno. The groom, James Hollie had one request for his wedding day, a song by Jagged Edge, ‘Let’s Get Married Remix’ . ‘Meet me at the altar, in your white dress’. I suggested that he try something not unique, but rarely used, the groom’s entrance song. The reception immediately following the ceremony was held in the Lower Deck at the Lighthouse Inn. 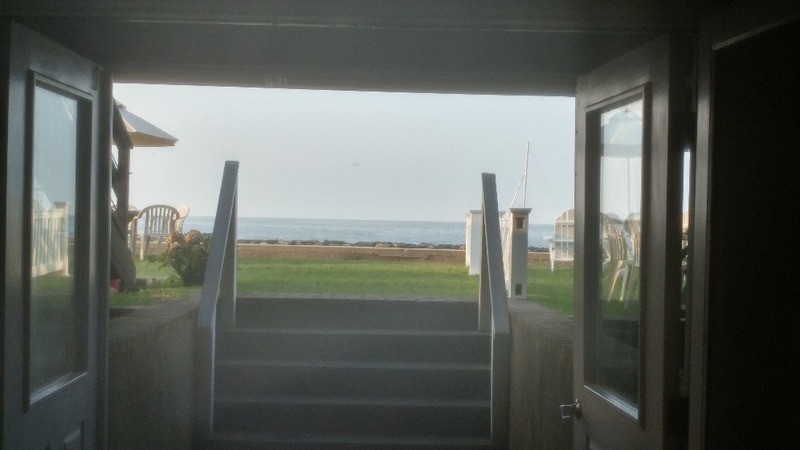 This unique room sits just below ground level, providing an incredible view of the ocean that appears at high tide to be at eye level when you are standing looking out the windows. One of the most unbelievable backdrops to a dance floor that I have had the fortune of seeing. The night was truly a special one. 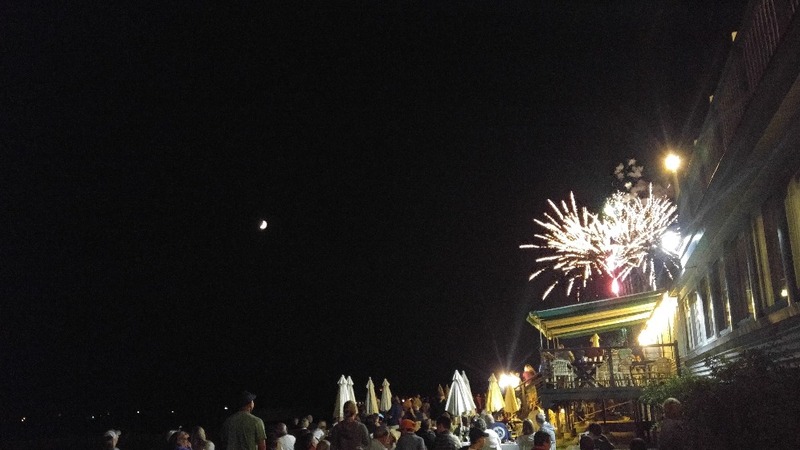 The evening became something more as there was fireworks on the beach right next to the Lighthouse Inn!! Theresa and James led everyone just outside to witness a fabulous display of pyrotechnics. The fireworks lasted almost 20 minutes climaxing with an awesome grand finale. Just writing about this wedding reception has kept me smiling and feeling good. Thank you, Theresa and James, for allowing me to be a part of this recent wedding on Cape Cod, a truly unique and magical evening! Want the Perfect Wedding Ceremony? Want the Perfect Wedding Reception? This entry was posted in Professional Wedding DJ, Recent Wedding Posts and tagged [;, a good wedding dj, cape cod wedding, Professional Wedding Emcee & DJ on October 17, 2017 by Jack Barros. Thank you and Congratulations to Katelyn Carveth and Kenae Brooks on their recent wedding reception at the Hilton Honors Providence Biltmore Hotel. Thank you for allowing me to be a part of your wedding reception! to the love story brought to life by the welcome to the family, by dads, Eric Carveth, and Walter Brooks and toasts by Maid of Honor Anne Marie “Sissy” Skiffington & Best Woman, Monica “OJ” Cooley! Keefer Dowell grabbed the microphone to do a parody of all the things the bride & groom should do if they want to stay married! (Such as always go to bed angry with each other). Additional toasts after the cake cutting from Brendan “Scumbag” Powers and Geoffrey Lake led into traditional parent dances and a special song to Katelyn’s mom Dawn Carveth. The traditional bouquet and garter toss included a cold one for Kenae! (Who chugged it down to cheers from the guests!) And Pedro putting the garter on Jacob! I had been looking forward to this wedding receptions dance party. (my favorite part of any wedding! Just saying) And I was not disappointed! The music guidelines that Katelyn & Kenae provided was spot on. The guests I had a chance to talk with at their tables and later had requests that everyone wanted to hear! The dancing never stopped! Don’t tell anyone they were even dancing on the windowsills! Thank you to Monique Bernard Avila and Norbert Avila (Norbyyyy I didn’t know that was you till after the reception!) for referring this wedding to me. Thank You Eric Carveth for your generous gratuity. I almost feel guilty for getting paid for doing what I love to do for such a great group of people! Kudos to Ray Conaty (photographer) and Bryan Way of Bright Birch Films. I never saw you guys! (One of the greatest attributes of a wedding photographer or videographer is their ability to get the ‘shot’ without becoming the shot.) Great Job guys. Following is a little teaser of Katelyn & Kenae’s wedding day by Bryan. For those of you that went to the wedding, stop by my Facebook page, find any Katelyn &/or Kenae Picture and leave a comment. If you enjoyed yourself, I would truly appreciate you liking my page. If you did not enjoy yourself, please message me and tell me what I could have done better, like remembering my man, Norbyyyy! 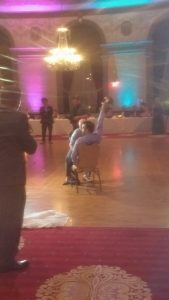 The 2 images in this article of the wedding were taken from my smart phone. Follow this link for great images from Ryan Conaty, the pro photographer. Lots of images here, go to the later pages to see the dance part of the reception. 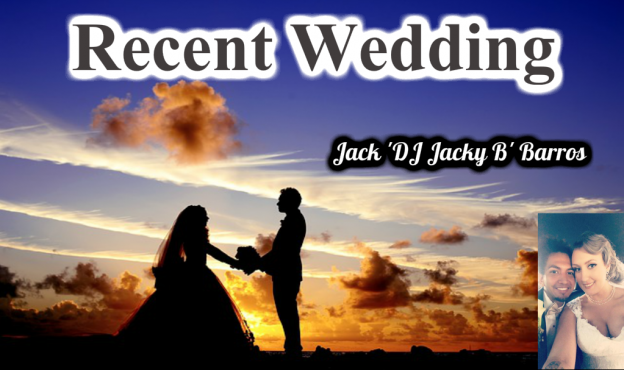 Recent Weddings with DJ Jack Barros aka Jacky B! 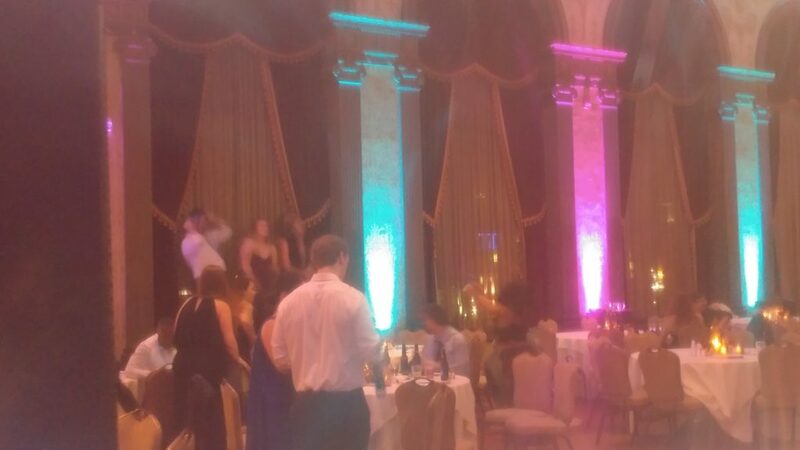 This entry was posted in Professional Wedding DJ, Recent Wedding Posts and tagged boston area wedding dj, Professional Wedding Emcee & DJ, real wedding, wedding at Hilton Honors Providence Biltmore Hotel, wedding reception on September 10, 2017 by Jack Barros. A great time was had by all at the wedding at the Charles Hotel in Cambridge for Jennifer Catelli & Michael J Person. 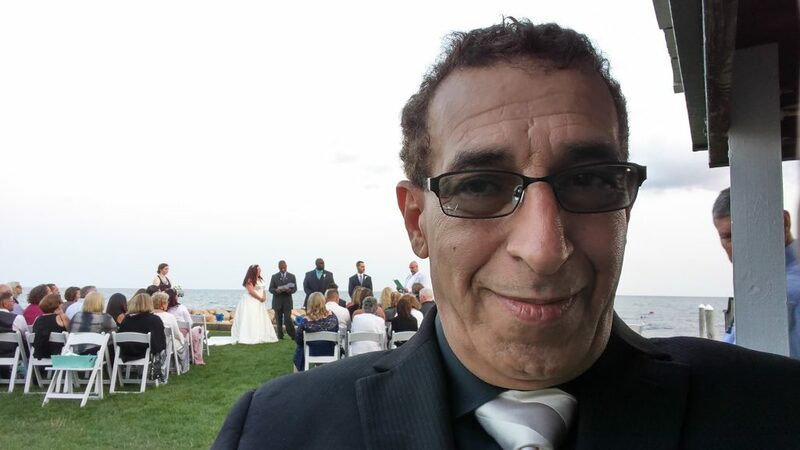 Michael provided Worcester area wedding DJ Jack Barros with a great playlist of songs for the guests to dance to. Jennifer and Michael set the tone of the night with a first dance that shared their passion for dance and each other. Many of Jennifer & Michael’s guests were ball room dancers and wowed the crowd with moves worthy of Dancing With the Stars! A really incredible tango had most of watching in awe as this couple performed like I’ve never seen in my 30 year career! What a great way to start your married life together! I am thankful to have been a part of such a fun night. Great big thank you to Sarah German and the staff at The Charles Hotel for helping me to overcome unforeseeable delays and equipment malfunctions. Thanks Sarah for going above and beyond to ensure that our bride and groom were happy! Jennifer & Michael, may you share forever the love and happiness you shared with us at this real wedding at the Charles Hotel in Cambridge. Looking for a wedding DJ? Check out the Ultimate Guide to Hiring a Wedding DJ. 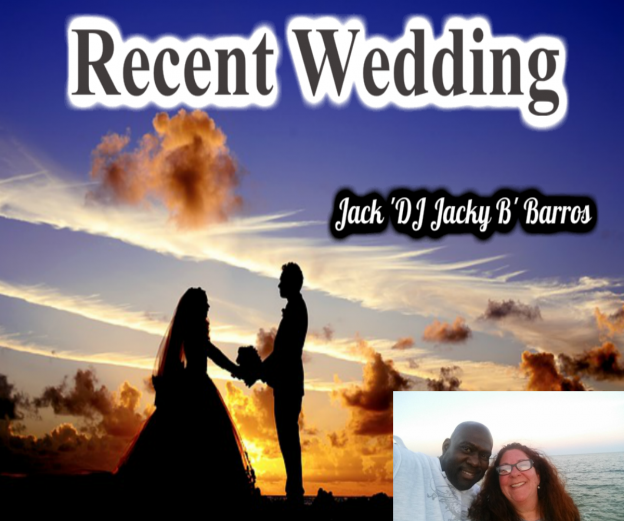 Recent Real Weddings with DJ Jack Barros aka Jacky B! This entry was posted in Professional Wedding DJ, Recent Wedding Posts and tagged boston area wedding dj, boston wedding dj, boston wedding emcee, wedding dj tips, wedding information on October 12, 2015 by Jack Barros. Thanks so much for making our wedding day entertainment perfect! Jack was friendly. Enthusiastic and a true professional! He made our party very special! Jack was great! He kept everyone on the dance floor all night! He did a wonderful job! CopyRight &COPY; 2019 DJ Jacky B all rights reserved.